Christmas Ornaments Made in USA - 2011 & 2010 Official White House Ornaments - A Christmas Ornament Co. This gift set includes the 2011 White House Theodore Roosevelt Ornament along with the 2010 White House William McKinley Ornament. This set is a perfect gift for someone starting their own collection or for those who forgot last year’s ornament. The 2011 White House Christmas ornament honors the administration of Theodore Roosevelt, the twenty-sixth President of the United States. And the 2010 White House ornament commemorates the Annual Army Navy Reception at the White House from the year 1900. 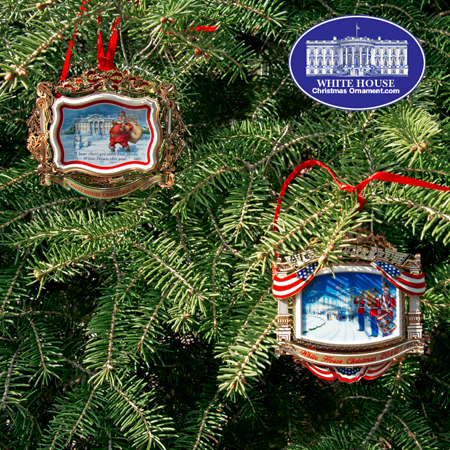 Both ornaments are double-sided and depict classic winter scenes from the White House. The 2011 White House Theodore Roosevelt Ornament has the Roosevelt family gathered around a Christmas Tree inside the White House. The back of the ornament shows Santa Claus crossing a snow covered North Lawn proudly proclaiming, "I hear there are some kids in the White House this year." The 2010 White House William McKinley Ornament shows a colorful scene from the annual Army navy Reception at the White House in 1900. The back of the ornaments shows the United States Marine band playing their instruments as guests arrive for the party.